The Masquerade Launchers are different in appearance. While the Wrist Launcher is triangular in shape, the Masquerade Launcher is round. It is also dark in color, mostly black. Only the Wrist Launcher (Brawlers Launcher) was released. 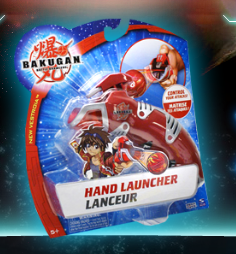 The Bakugan Hand Launcher was also released. 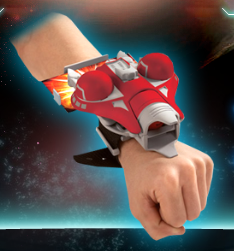 The Wrist Launcher had to be worn on the wrist but the Hand Launcher just had to be held while you control how to shoot the Bakugan ball into play. 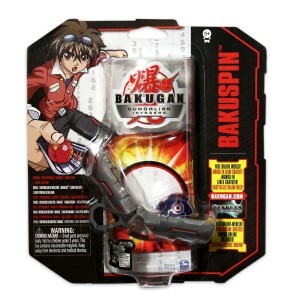 With season 3, Gundalian Invaders, the BakuSpin was released. This is the most recent launcher, and it does not differ from the Hand Launcher that much. The pack contains an instruction guide on how to make good shots with it. Season 4 of the Bakugan series, Bakugan: Mechtanium Surge, brought out another Bakugan launcher. The Bakugan BakuLaunch is different from the previous launchers though, in a way that it has another function. The MS BakuLaunch is a 2-in-1, acting as both a storage and launcher for Bakugan balls. 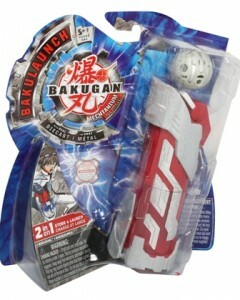 The pack contains 1 BakuLaunch as well as 1 closed Bakugan.